During the winter of 2018, UK Sailmakers Ireland, in conjunction with Pat Considine of UK Sailmakers Chicago, carried out a Fluid Structure Interaction (FSI) test cycle to determine the effectiveness of jib inhauling to a sheeting angle of 6° – just inside the halyard turning blocks on a standard J/109. Our aim was to improve speed and point. In grand prix classes throughout the sport of yachting, it is well known that sheeting angles are becoming tighter and tighter – modern TP52s have jib sheeting angles as close as 4 degrees off the centerline. 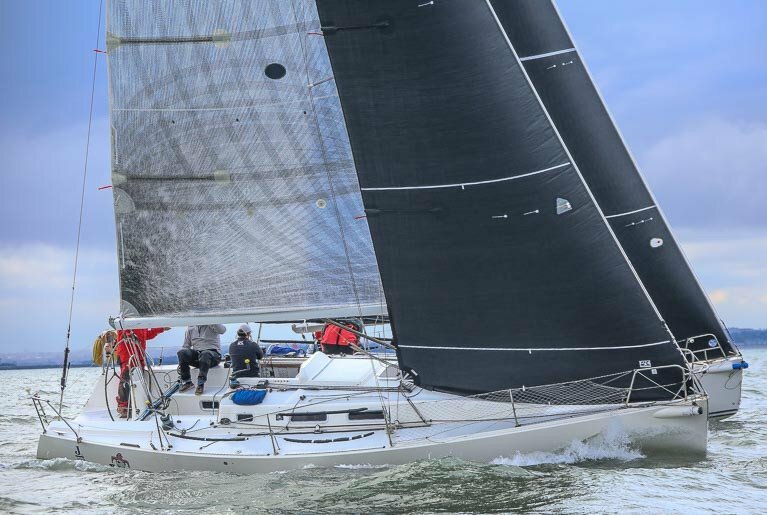 The J/109 class in Ireland is a growing and competitive fleet, so UK Sailmakers felt it necessary to take a fresh look at the sail plan and systems aboard the nearly fifteen-year-old design. The J/109 have evolved significantly over the past fourteen years. The most visible change has been the shift to a non-overlapping jib setup for optimum IRC performance. This shift in sail plan has had a significant lessening effect on the boat’s light air performance due the headsail area reduction. To compensate for this reduction in power, the class uses an inhauling system – this narrows the slot between the mainsail and headsail, in turn increasing the power of the entire sail plan. Up until now, the common inhaul point for a J/109 has been the edge of the coach roof – approximately a 9° sheeting angle. This is effective in true wind speeds of 15 knots and above – but below this the boat is still relatively starved for power when compared to their genoa flying predecessors. We believed further performance was attainable by working with the sail plan. It quickly became clear that simply raising the clew of an existing sail and inhauling it harder will not increase driving force. In fact, inhauling this hard with a standard jib actually slows the boat below the base line numbers from the initial test setup. A new sail design was required. In the following we detail the process of a FSI study – and present some of our findings and results. For the purposes of this article we have simplified the FSI testing process to a number of high-level steps. In layman’s terms, think of FSI as a digital wind tunnel. We decided on a specific set of conditions in which we believed our inhauled setup would perform best – this was 10-12 knots in a flat sea-state. These conditions would allow an amateur helm to steer to the tighter sheeting angle without dropping out of the groove. With our target weather conditions decided, we gathered and input our J/109 polar data for the test case. Variables include, but were not limited to, heel angle, leeway, boat speed, wind direction etc. With our target conditions determined and our polars set, we then moved on to the design phase. Our standard J/109 class mainsail design was used throughout the testing process – this is consistent and does not change. As we believed what was required to this increase power was a specialized light wind sail, we begin with a J1 mold for the jib. Deeper than the standard J/109 class jib, which is a crossover between a J1 and J2, the new design is deep with twist for power in light airs. With our sail designs selects, we then virtually configured our J/109 for sailing in the 10-12 knot conditions present in our test case. In our computer model, we set the rake, mast bend, sheet tension, halyard tension, outhaul, jib car position, backstay tension etc., until we reached the optimum settings–producing the maximum amount of lift for the least amount of drag. To get to this optimum setting required an iterative process of adjusting, testing, re-adjusting, re-testing, etc. This was where the skill and experience of the designer really came into play to reach the fastest settings possible. One of the key things in this phase of testing was to set the inhauler so the clew our J1 jib to be touching the coach roof coaming of the cabin top. This places the jib at a sheeting angle of 9° from the centerline. In this phase we looked for performance trends. As we made changes and re-tested, we expected the trend to be positive – either an increase in lift or a reduction in drag – both leading to positive outcomes. Once the trend began to plateau or even turned negative, we knew we had reached the optimum trim for this particular design. Once the designer could no longer improve the virtual performance of the boat by adjusting sail controls, the iterative process stopped. A series of comprehensive FSI runs were then done on this setup to provide a baseline set of data to compare and contrast the next round of test against. We then implemented our suggested improvements to our J1 jib design. Our aim was to sheet this sail at an angle of 6° from the centerline of the boat – this is just inside the halyard leading blocks of the standard J/109 deck layout. We called our new design the ‘JX’ headsail. When a sailor hears twist, he or she usually thinks of easing the sheet to induce it. What many sailors don’t realize is that there is twist designed into the shape of every sail – they are made to sail with an optimum amount of twist. For example, the standard mainsail design twist is approximately 12°. Returning to our testing, we begin to increase the amount of design twist in our ‘JX’ headsail. As the design twist increased drag reduced, and driving force increased. While adjusting the design twist the virtual trim of the jib was also adjusted to keep the sail trimmed optimally. Once we saw the lift/drag/driving force trend begin to plateau, we reached optimum design twist. We settled on a maximum of 7.6° increase in design twist distributed vertically. This allowed the sail to maintain a consistent twist relationship with the mainsail at the smaller sheeting angle of 6°. When inhauling at tight angles, it is very important not to ‘shut’ the slot with a return off the headsail leech. A leech hook or return at such tight sheeting angles causes an enormous amount of drag while also clogging up the slot. A straight exit off the leech is needed. A leech hook or return is often cause by the depth of the headsail moving aft towards the leech. This causes the entry to become fine and the leech to close in towards the mainsail–keeping the max camber position forward in the sail is essential. As we increased our design twist and brought our sheeting angle well inboard, we then adjusted the max camber position of the sail. Over several iterations we found a gain in moving the max camber position forward. This prevented the upper sections of the headsail from shutting the slot. Several camber adjustments were made in order to keep the straight exit from the leech of the sail. Notably a reduction in aft camber in the sail’s lower sections. As a result, the overall camber in the lower sections of the sail was also reduced. These flatter sections ensured a straight leech exit at maximum inhauling. The lower depth is now controlled by the positioning of the trim point, i.e. the clew position controlled by the trimmer. This allows a narrower sheeting angle without an increase in mainsail backwinding. FSI pressure map comparison of the original UK Sailmakers J/109 jib design (Left) and the JX design (Right). The increased pressure on both sails can be seen by the increased amount of red on the JX design. Having worked on our ‘JX’ design for many hours we settled on the new design. We ran the same comprehensive set of FSI tests as were run to provide our baseline set of figures. Below we go through some of our findings. Above (PHOTO) you can see our J/109 test platform. The left picture is our baseline J1 headsail design. To the right is our new ‘JX’ headsail design. This picture is a leeward view of the sails’ pressure mapping. It can be clearly seen that the ‘JX’ design produces a significant increase in pressure differential when compared to the J1 design. Not only is there a pressure differential change on the headsail itself, but also on the mainsail. This shows that harder inhauling can improve the effectiveness and efficiency of the entire sail plan. In our FSI testing, we controlled how the sail plan was trimmed for proper flow across the luff in 12 knots true wind speed at 37.5° true wind angle. Boat speed of 6.34 knots with 18.8 degrees of heel and 3 degrees of leeway. Mainsail shape and trim remained constant throughout testing in order to isolate the jib design adjustments. Our subsequent FSI testing runs provided a set of numbers for our new ‘JX’ design. Notable numbers below with deltas from previous testing. With the new ‘JX’ design we are able to achieve a 1% increase in driving force and a 1% increase in lift coefficient of the sail plan. There is, of course, the associated increase in drag and heeling moment; but in 12 knots of true wind speed these can be overcome by righting moment – hike harder. The other option is to turn the increased lift into height instead of fast forward. At a true wind angle of 36.5° we maintained the same total coefficient of lift but loose some driving force as a result. It must be noted that the mainsail trim was not altered between FSI tests. In reality, when at a smaller sheeting angle, the mainsail would be brought further to windward to maintain the open slot. This would produce an increase in lift coefficient, side force, and drag. All of which could be overcome by more hiking. And, as we all know in this wind speed – whoever gets their crew hiking fully first usually wins. In April 2018, UK Sailmakers Ireland’s Barry Hayes, Graham Curran, and Mark Mansfield carried out a two-boat testing session with the newly developed ‘JX’ headsail design. They used two well matched J/109s, including the reining Irish Class and IRC National Champion “Joker II”. The test was carried out in ideal conditions with 10-12 knots true wind speed and flat water on Dublin’s Dun Laoghaire Bay. Two-boat testing on Ireland’s Dun Laoghaire Bay. Several hours were spent upwind testing – lining-up bow to bow in the same breeze. There was a notable difference between the two headsails when both were inhauled hard to a 6° sheeting angle. The ‘JX’ jib remained twisted and fast while the other jib tended to shut out early and cause excess back winding of both mainsails. The J/109 is a 14-year-old design – you may ask, why wasn’t this done sooner? The reality is that the material improvements in sailmaking over the last decade have been significant. Not so much in what materials are being used, these are fairly constant, more so it is how they are combined in cloth technology. UK Sailmakers’ Uni-Titanium cloth allows us to build sails with constant draft, depth, and clean leech exits over a large range of wind conditions. Where traditional Dacron or string sails would deform and deepen as wind speed increases, Uni-Titanium sails remain rigid in their design shape. This is essential to modern sail design, particularly sheeting headsails to narrow angles. Throughout our FSI testing period it became clear that closer sheeting angle would improve the overall performance and efficiency of the J/109 sail plan. However, we were not convinced that this would be the case in a real-world situation out of the virtual test box. After on the water test, and several major regattas and a Round Ireland Race, we were happy to conclude that the ‘JX’ headsail development has been a success. There is much more to inhauling jibs than you may realize. It is common to think of your headsail independently – but it is just one cog in the machine. The relationship between it and the mainsail, and between the sail plan and the underwater profile of the boat must all be considered – they all combine to produce a force which moves you forward, preferably faster than your opponent. If any of these relationships are out of balance then the entire system will begin to crumble. Our virtual and on-the-water testing produced other potential performance improvements to pursue – we are continuing our investment in the J/109 class and sailors will be seeing these developments, and more, on the water throughout the coming months. Newer PostNEW CODE ZERO SOLD BY UK SAILMAKERS GERMANY, DELIVERED TO PANAMA IN 9 DAYS!